My son presented the Arduino Data Logger he wrote for my circuits class to the Global Physics Department on 2013 May 15. The sessions are recorded, and the recording is available on the web (though you have to run Blackboard Collaborate through Java Web Start to play the recording). I thought he did a pretty good job of presenting the features of the data logger. He’s down to only three classes now (US History, Physics, and Dinosaur Prom Improv), though he still has homework to catch up on in Dramatic Literature and his English class. He’s still TAing for the Python class also. On Thursday and Friday this week, he’ll be taking the AP Computer Science test and the AP Physics C: Electricity and Magnetism test. He’s having to take both tests in the “make-up” time slot, because we couldn’t get any local high school to agree to proctor the tests for him during the regular testing time. Eventually his consultant teacher convinced the AP coordinator to let her proctor the tests, but by then it was too late to register for anything but the makeup tests. We’re way behind schedule on the physics class, so he’s just going to read the rest of the physics book without working any problems before Friday’s exam—we’ll finish the book in a more leisurely fashion after the exam. He won’t be as prepared for the physics exam as I had hoped, but at least the CS exam looks pretty easy to him. Depending on the reasons for late testing, schools may be charged an additional fee ($40 per exam), part or all of which the school may ask students to pay. Students eligible for the College Board fee reduction will not be charged the $40-per-exam late-testing fee, regardless of their reason for testing late. Schools administering exams to homeschooled students or students from other schools may negotiate a higher fee to recover the additional proctoring and administration costs. We’re paying $145 per exam (not just the $89 standard fee and the $40 late fee), but I’m glad he gets to take the exams at all this year. Tomorrow he and I are doing another campus tour—this time at Stanford. He managed to get an appointment with a faculty member, but we noticed that the faculty member is scheduled to be teaching a class at the time of the appointment—I wonder what is going to happen with that. I’ll report on the visit later this week. In today’s lab we derived the formula for the period of a simple pendulum (assuming the small-angle approximation), , then measured both circular and simple pendulums. For the circular pendulum we measured the radius of the cone on the first orbit and the last orbit, the length of the string (the slant height of the cone), and approximated the period by timing 10 or 20 periods and dividing. For the simple pendulum, we used the photogate setup described in More on pendulums, to get very precise and repeatable measurements of the period. The hardest part for us was measuring the length of the pendulums, since the center of mass for the bob was not obvious and the exact position of the pivot was not obvious—these uncertainties probably resulted in length measurements being ±5mm, making a large contribution to inaccuracy. The range of estimates for g is larger than I would like. I think that the decay of the oscillation of the pendulum makes quite a difference. The average of all the estimates of g is 967 gm/sec^2, which is rather low. The pendulum ticked reliably for quite a while, and the periods were remarkably consistent. The estimates of g from the simple pendulum are good to about 0.5%, which is the limitation of accuracy on our pendulum length measurements and close to the limit of the accuracy of the small-angle approximation. The average of the 5 measurements looks good to about 0.2%, which seems pretty good to me, since we certainly weren’t measuring the lengths that accurately. While the lab was running, one of the students wrote a Python script (using numpy for mean and standard deviation) to read the data and compute the numbers in the table. We could have talked directly to the Arduino, but it was simpler to cut the numbers from the Arduino serial monitor and paste them into a file for the script to read. That allowed us to keep the Arduino running throughout, and just cut and paste the good numbers, discarding the junk from starting or stopping the pendulum. I’m quite pleased with the photogate setup, which was very simple to build and worked reliably during the experiment. Crudely wrapping tape around the string made a lumpy opaque object, whose rotation probably contributed to the standard deviation of the period—having a smoother cylinder for the optical blocker would probably make the period measurement much more consistent. But that would not improve the mean estimates much since errors in adjacent period measurements cancel. I believe that our mean periods are much more accurate than the standard deviations suggests, with errors less than 1 per thousand. I had to make one change in the Arduino code during the lab to accommodate all the different pendulum lengths—I had a dead time before recognizing the next pulse, to prevent getting 2 pulses per period as the string passed through the beam twice. I started with a dead time of 1 second, which as a bit too long for the smallest pendulum. Reducing the dead time to 500 msec for that pendulum made it count reliably. Note that for the 2nd and 3rd pendulum, we measured for about 3 minutes without a bad time measurement, and could have gone longer if we had had the patience. In Newton’s measurement of g, I described a failed experiment to measure g with a motorized circular pendulum. Further experimentation on my own lead me to adopt for this week’s lab the standard approach using an unpowered circular pendulum. The cone formed by the string can be described as having height , base radius , and hypotenuse , the length of the string. If the circular pendulum has period , then (derived in the Newton post). If we make the string long and push the pendulum with the right speed to get a nearly circular (rather than elliptical) motion, then is nearly constant for many orbits, and we can estimate the period with just a stopwatch by counting 20 or 30 periods. Using a large enough mass means that neglecting air resistance is now reasonable (which it was not for the tiny mass I started with). Thanks to John Burk for suggesting that I forget about the motor—that seems to be the best approach, even though I then can’t use the photogate to time the period. I’m hopeful that we can measure the height and the period accurately enough to get within about 2% of the right value for . This week in addition to doing the circular pendulum right, I wanted to do simple pendulums. I’ve assigned problem 4.P.89 in Matter and Interactions, which seems to be the only place in the book that simple pendulums are done. It is a computational problem, since there isn’t an analytic solution (though the small-angle approximation works pretty well up to about 45°). I hope the students have done that by tomorrow! I wanted to measure the period of the pendulum directly (not averaging over many periods), to demonstrate that the amplitude does not matter much. Unfortunately, I’ve not yet built a sensor that works for this. I tried using the photogate, but I could not hit the 1 cm gap consistently, even with a shorter pendulum. I also tried using a magnetic sensor (using the circuit I used for the speed-of-sound lab) with a magnet for the pendulum weight, but that triggered at random times as the magnet came close. Even 20cm away the field was enough to trigger the detector, and I got almost random timings. A magnetometer was no better than the coil and comparator, as the magnetic field varied chaotically (from movements of the magnet other than the simple pendulum swing, such as twirling on the string). The magnetometer was usable as a compass, though, which is good, because I originally bought it for the robotics club to use as a compass. There are some tricky points to using it as a compass, which I’ll talk about in a different post. I then tried marking the top of the string with a bit of electrical tape and using the photogate there. That was the most successful so far—if I hold the photogate steady enough, I can get readings repeatable to ±20msec, which is much better than I can do with any other approach I’ve tried. For one pendulum hanging from the edge of my desk, I either got two pulses at about 1.11 and 0.45 seconds or one pulse every 1.56 seconds, depending on whether the marker on the string passes all the way through the beam or blocks it continuously at the end of the swing. The random variation I get is probably because of holding the sensor by hand (to align with the string). 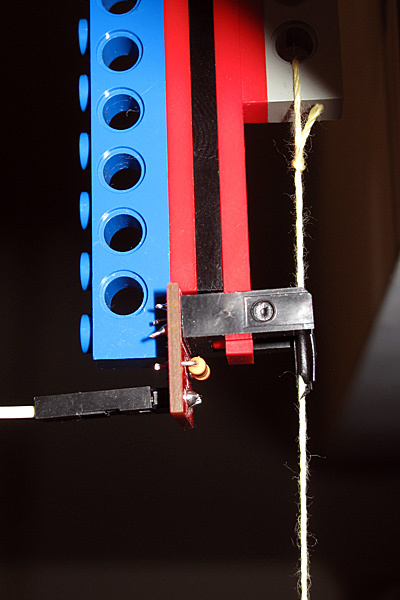 A view of the photogate mounted on the Lego beam next to the pendulum string. 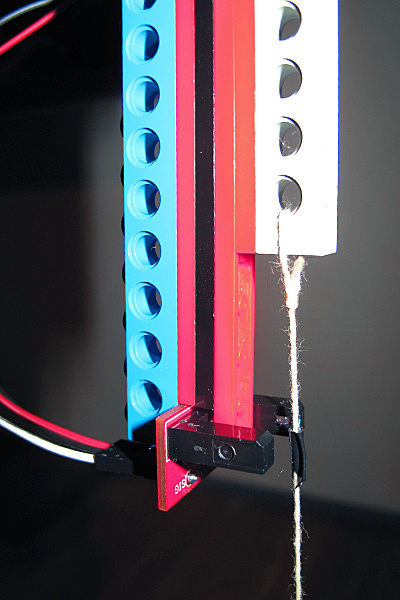 Closeup of the photogate, showing the breakout board and sensor wedged between a plate and a beam, with a 2-plate spacer. Having come up with a nice way to grip the photogate and still be able to swing a pendulum string into the gap, I connected the beam holding the photogate to the same right-angle platform that we had used last week for the motorized pendulum. This left a little gap that I could rest the Arduino board in, so that there was no tension on the wires to the photogate. I was a bit worried that I might have to put my laptop on top of a ladder, since the USB cord is not very long, but I have a spare pair of USB-to-Cat5 converters (one set is for the robotics project), so I was able to make an extension cord out of a flexible Cat-5 Ethernet cable, giving me enough length to put my laptop safely on the desk. 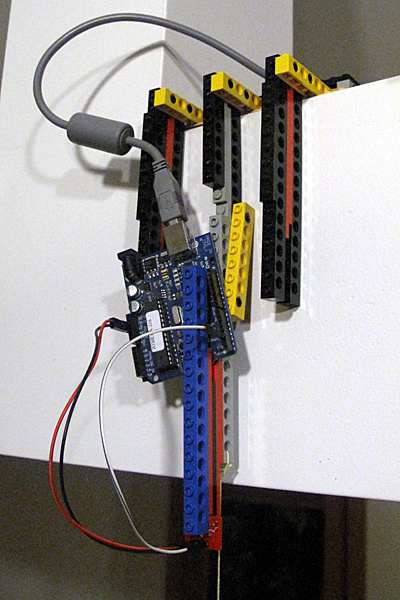 The same Lego that holds the photogate can also support the Arduino, so I don't need to hold anything in my hands. The speed-of-sound lab we did on 30 Dec 2011 went pretty well after all. 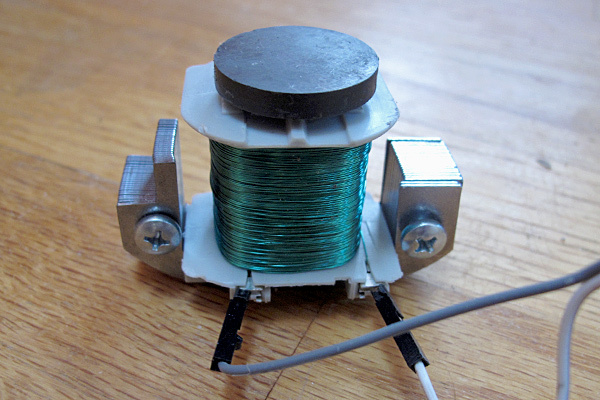 Coil (about 0.5H) with refrigerator magnet on top. Magnet is stuck to the core of the coil just by its own magnetism. The signal is not large enough to be measured by a digital input on the Arduino that we used for timing, and the Arduino analog-to-digital converter (accessed with analogRead()) is a very slow one, that would limit our time resolution to about 100 µsec, rather than 4 µsec as we can get with the “micros()” function call. I happened to have an LM311 comparator chip from about 30 years ago, so I made a comparator circuit to convert the analog signal to a clean digital signal. Comparator circuit used to convert the small electrical signal induced in the coil to digital levels for input to the Arduino. The pair of 15kΩ resistors serve as a voltage divider to set the bias voltage for the inputs to about 2.5 volts, in the middle of the range. The output pull-up resistor provides a load for the comparator. The two capacitors filter out high frequency signals picked up by the coil—they were not part of the circuit provided in the LM311 datasheet, but turned out to be essential. I did have to modify the circuit a little from the one for a magnetic pickup given in the data sheet, as the output remained high with that circuit. Adding small capacitors to the input and output seemed to fix things. I arbitrarily used 47000pF capacitors, because I happened to have several of them, but I also experimented with some other sizes (560 000 pF and 1000pF) which did not work. One effect of the capacitor on the input is to make a resonant circuit that rings with a period of about 800 µsec (eyeballed from the oscilloscope trace), which would make the inductance of the coil about 0.34H. This ringing has a couple of consequences: 1) if the magnet is the wrong way around, the polarity of the impulse is reversed and the comparator will detect the impulse half a cycle later, adding about 400 µsec to the reading, and 2) the signal ramps up slowly in response to an impulse, and the delay in the comparator circuit is dependent on the magnitude of the input signal. This will add noise to the timing measurements. Because the magnet we used had residues of paper and glue on one side, it was easy to check that it was oriented correctly. For one set of measurements, the coil and magnet had to be moved, and the magnet may have been upside down for that set of measurements, resulting in a different offset for those measurements. To keep the noise from differences in amplitude to a minimum, we took several measurements (generally 10 or 20) of each time, discarding obviously bogus numbers (like 8 µsec when the comparator had already detected something before the strike, or > 10 msec, when an impulse had been missed). On the Arduino, the following program was used measure times. Pin 2 of the Arduino was connected with a long wire to a metal striker, with the object being struck connected to Arduino’s GND with another wire. Contact between the two metal objects pulled pin 2 down (overpowering the 20kΩ pull-up in the Arduino), recording the time in start_1. As soon as the comparator detects the sound, pin 3 is pulled down, and the time is recorded on stop_1. The resolution of the timer is about 4 µsec, but the repeatability of the times varied more, depending in part on how consistently the strikes were made (one of us appeared to have much more consistent technique than the others, and the times from his strikes had lower spread—we did not record who did the strikes on our data log, and so we can’t quantify this observation). The vertical rod is the one being measured. The sensor is on the floor and the rod is struck at the top end. The breadboard has the comparator circuit connected to the Arduino, which in turn is connected to a laptop (not in the photo). The setup for most measurements was simple: the coil was put on the floor with the magnet resting on top. A rod was held vertically on top of the magnet and struck at the far end with another rod. Initially, we used a small screwdriver as the striker, but this turned out to be hard to hold, and so we switched to using a foot-long piece of ¼” steel rod, which was also used for some of the timing tests. Because the delay in the comparator is unknown, but likely to be substantial compared to the time of flight, we tried to measure the same material at different lengths, and do a straight-line fit of the data to estimate the offset. By doing many measurements at each length, we could average out a lot of the noise. We could also see how well the data fitted a model that assumed that the time delay for the sound arriving would be proportional to length—that is, does the speed-of-sound model make sense for this data? The simplest set of data was for 3 rods ¼” in diameter, made of hot-rolled weldable steel (that’s all the information about the material that the hardware store had on the tag). 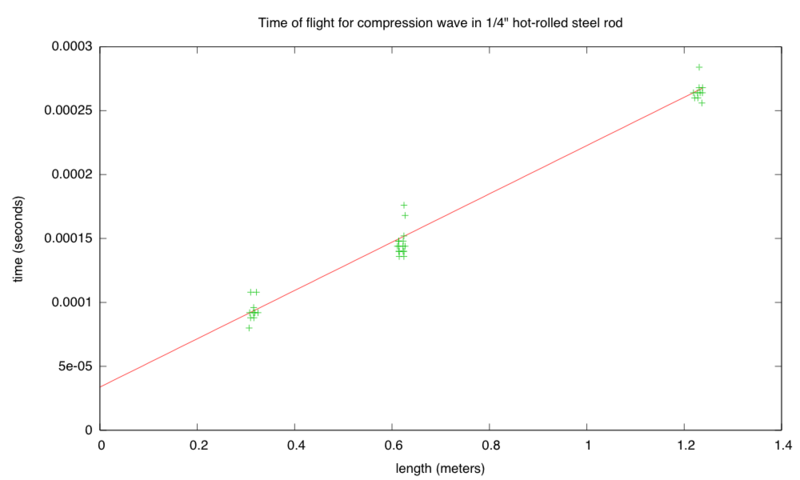 I’ve put the data in a page on the blog: Steel rod speed of sound lab data. We also measured one aluminum bar (Aluminum bar speed of sound lab data), one long copper tube (Copper tube speed of sound lab data), and two wood dowels (Wood speed of sound lab data). Because wood is not conductive, we added a washer on the striking end of the dowel, to provide a conductive contact. 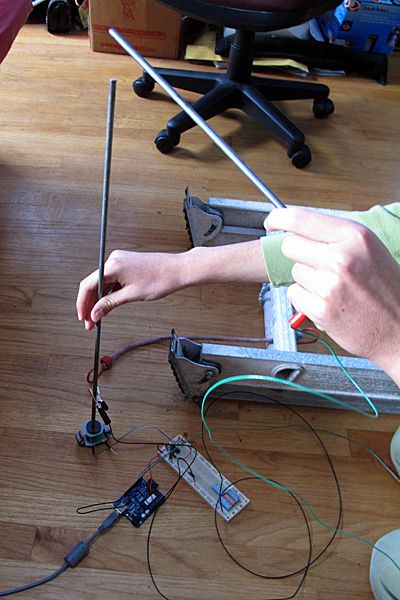 The copper tube was about 3m (10′) long and very soft, so we laid it on the floor and duct-taped the sensor to one end. 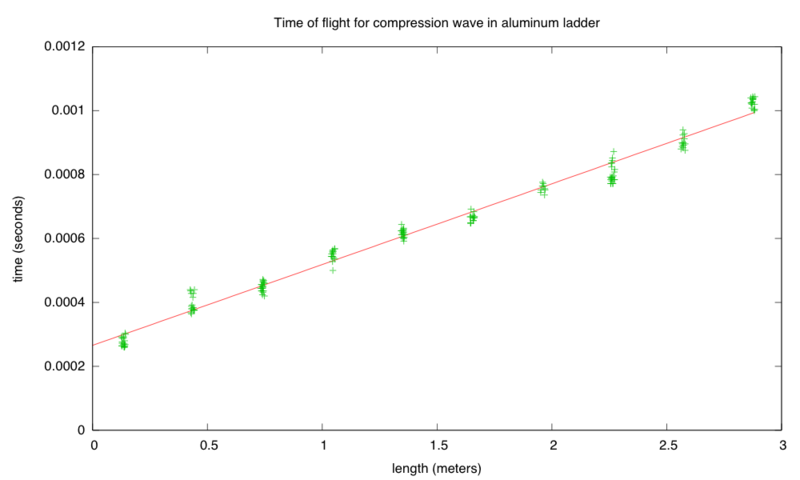 Perhaps the most interesting data set comes from an aluminum ladder (Aluminum ladder speed of sound lab data). We removed one foot from the ladder and duct-taped and bungey-corded the sensor to the bottom of the ladder. We then struck the ladder inside the hollow rungs, providing a nicely spaced series of different ten different lengths. Because of the difficulty in getting the duct tape to stick to the ladder, the magnet fell off and was replaced a few times in setting up the sensor. The final orientation was not checked, but I believe that it was backwards, so that the delays of the sensor were substantially larger for the ladder than for the other measurements. Luckily, there are enough different lengths that we can get a very good linear fit even with a large offset. set title "Time of flight for compression wave in 1/4\" hot-rolled steel rod"
The linear model seems like a pretty good fit for the data on the steel rod, but the scatter on the data is a little high. Note: small random jitter was added to the x values, in order to spread the points out. After eliminating the outliers, the estimated speed of sound is 5267 m/s and the sensor delay is 31 µsec. The best match is for the copper, with our aluminum alloys having a much lower speed of sound than typical for pure aluminum (does our alloy have higher mass? lower stiffness? ), and our wood dowel having a much higher speed of sound than typical for wood. The steel rod was a little low, but within the range of reported speeds of sound in steel. This report took me several hours to write, in part because producing the graphics took a while, and in part because I fussed around a lot with seeing if removing outliers from the data helped get better results. My son produced a substantially similar lab report, with graphs but no pictures or schematic of the comparator, in 2–3 hours. He did not play with removing outliers. He also correctly reported the velocities with only 2 significant figures (in cm/µsec). The Slinky Lab post got an interesting pingback from Engineering Failures » Secrets of the ‘Levitating’ Slinky, which describes the curious phenomenon that happens when you suspend a slinky vertically, then release the top end. The bottom end does not move for about 0.3 seconds, when the compression wave from the top reaches it. It might be worth videotaping that phenomenon in this week’s lab. I think it might be interesting to try to calculate (either analytically, or as part of the VPython simulation) the movement of Slinky as you drop it. In particular, I’m curious at what point the compression wave becomes a shock wave (that is, when does the top of the slinky start moving faster than the speed of sound in the slinky). Note that the speed of sound in the slinky is best expressed as “coils per second” rather than m/s, in order to get a constant speed of sound in the non-uniformly stretched slinky. The other lab/demo I was thinking of doing this week, measuring the speed of sound in a metal bar, is not going so well. I was planning to use a setup similar to that in the Chapter 4 Lecture 3 video at http://courses.ncsu.edu/py581/common/podcasts/. That is, a long metal bar, with a microphone at one end, tapped with metal striker at the other end. A clock is started when the tap is made (a simple electrical connection), and the waveform is recorded at the other end. The first problem was that I did not have a suitable microphone. I found a quick workaround for that problem, as just last week my wife had given me a fine electromagnet that she had found in the street (we have a lot of “found objects” at our house). The coil has a 68.3 Ω resistance and a laminated iron core, so waving a magnet around near the pole piece results in a fairly substantial electrical signal across the ends. So I made my own “microphone” with the coil, a refrigerator magnet, and a folded piece of paper as a spring. If I rest a piece of aluminum bar stock on it and tap the other end, I get a signal of about 0.3 v, which I can see clearly on my oscilloscope. If it was a storage scope, I’d be almost done, since I could trigger on one channel and record on the other. I might still have to do something like that with my analog scope. What I had hoped to do was to use an Arduino to measure the time it took from the tap to the signal arriving at the other end. Using the micros() subroutine provides timing with a resolution of about 4 microseconds, and starting it on electrical connection from the tap is pretty easy. I had initially thought to use the analogRead() function, but it is too slow: each analog-to-digital conversion takes about 100 microseconds, and the speed of sound in aluminum is about 6400 m/s, or about 150 μsec to go a meter. I don’t think I can do speed measurements with that low a time resolution unless I had a bar of aluminum 100s of meters long. That means that to use the Arduino for timing, I have to convert the analog signal to a digital one by some other means. 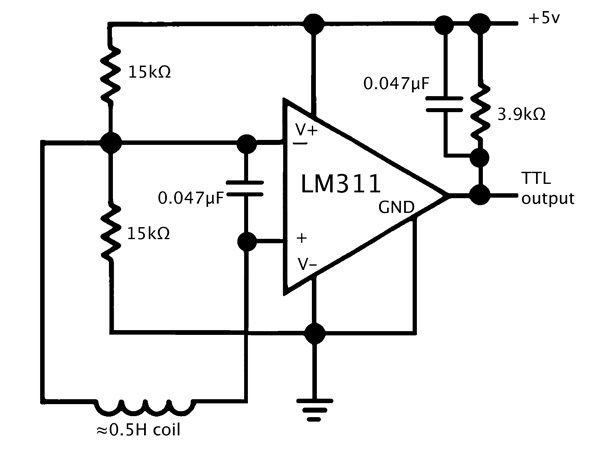 The most obvious method is to use a comparator chip, such as an LM339. I looked through the spare chips I have from 30 years ago, and found one LM311-N14A chip, which has a comparator that takes only a +5v supply. The data sheet even has a circuit for a “magnetic transducer”. I tried the circuit, and found that I needed to add capacitors across the input and the output to reduce noise that otherwise kept the comparator triggered. I tried it out with a piece of aluminum about 1.026m long, and got numbers in the range 272μsec to 304μsec, which would be speed of sound of 3380 m/s to 3780 m/s. That is a little slower than I expected. One possibility is that the comparator is not responding to the movement of the magnet toward the coil, but the rebound as it moves away. If I flip the magnet over, I get even longer times (784μsec to 884μsec), so I suspect the first orientation was the correct one, and the speed of sound in this aluminum alloy is a little lower than I expected, or the comparator circuit is adding some delays. I’ll have to make a bit more robust way of holding the magnet and stuff, before Friday’s lab/demo, since everything is currently rather wobbly (the magnet is held to the coil with a PostIt note to act as the spring).